A sequel to the Ibsen classic, set fifteen years later. 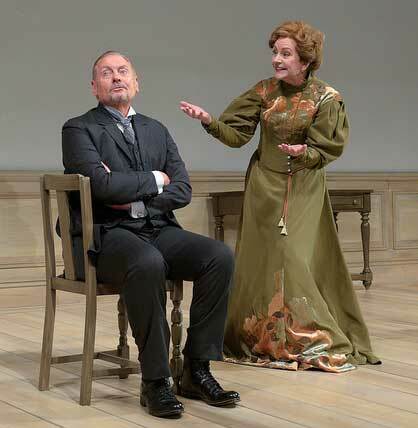 At the end of Ibsen’s A Doll’s House (1879), Nora (Mary Beth Fisher) has famously left Torvald (John Judd) and set out on her own, leaving him and her children in the dust. Now, in the sequel, she returns fifteen years later to clear up a messy legal situation. She encounters Anne Marie (Nancy E. Carroll), the housekeeper who raised Nora’s children, Torvald, and Emmy (Mikki Massoud), her daughter. The cleverly inspired idea to write a sequel to the powerful and inconclusive Ibsen classic provides, in itself, the bulk of the play’s accomplishments. While one regards the innovations of the original and the dramatic thrust of its conclusion, it leaves a lot unanswered. Playwright Lucas Hnath has performed an interesting service in taking this inconclusiveness to task and attempting to provide some kind of answer to it. The result is a series of conversations between Nora and the others, namely Anne Marie, the housekeeper, Emmy, her daughter, and Torvald, the husband she abandoned. Each of these conversations is entitled with its principal interlocutors; the culmination occurs in the conversation entitled Nora and Torvald and is in many ways the most persuasive and touching. Despite Hnath’s attempts to unlock the mysteries of Nora’s character and her decision to leave Torvald, much remains unanswered. She has gone on to a career of her own, and what emerges from her encounter with her past is a kind of pride in her accomplishments and a confession of a preference for solitude. This somewhat odd conclusion, particularly in response to Torvald’s quite open reception, provides little enhancement of her character or illumination of her intentions. The result is a series of vignettes that represent improvisations on the possibilities of character without actually defining it in any clear way. One would say that Hnath’s narrative is principally suggestive rather than illuminating; it points the way for thinking about Nora’s intentions and development and what might have gone into the rash gesture of a young woman in the late nineteenth century bent upon something resembling independence. The writing poses an odd hybrid of traditional language and outlook that is peppered with contemporary four-letter expostulations which, due to their unexpectedness, draw laughs from the audience but don’t make much sense otherwise. The stark but noble set by Andrew Boyce that frames the action is bare but elegant and provides an abstraction of background that signifies this twenty-first century approach to the problem of the nineteenth century Ibsen drama. 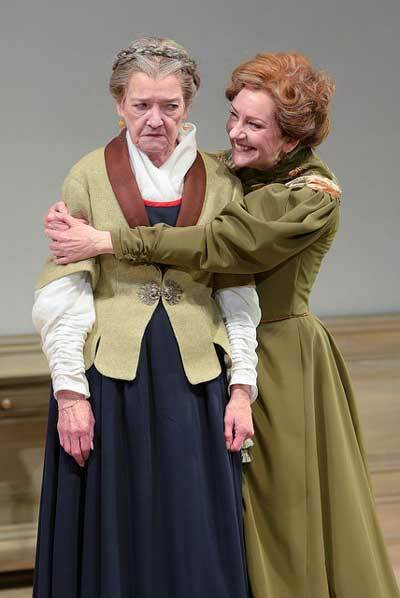 Nancy E. Carroll, the veteran Boston-based actor, is terrific, as she is so frequently, as the housekeeper Anne Marie. Carroll’s stock in trade of long-held framing silences frequently point the way, fairly hilariously, to the loaded background of significance and intention that her characters possess. In that way, Carroll makes the role reverberate here far more than the words do. She possesses the character implicitly and by doing so adeptly bears the weight of moral reflection on Nora’s actions. As Torvald, John Judd does a credible job of conveying a man stunned by the loss of his wife and by her return. The part is the best written in the play and Judd conveys a sense of Torvald’s character development; he’s not as stuffy as one would have expected and has grown in a variety of ways since the departure of his young wife. When, in his final conversation with Nora, he reaches out his hand, Judd gives Torvald an unexpected tenderness, merging the background stiffness with a flexibility born of age and pain. As Emmy, the daughter, Nikki Massoud, is energetic and defiant, what one might expect a daughter of young Nora to become. Though she shines brightly in the role, the problem with the part is that it really is a depiction of a young contemporary woman, not one from the era of the original play. There is little or no nuance in the role and, due to the writing, Emmy shows virtually no interest whatsoever in who her mother is or why she left her family behind. It’s an unexpectedly brash and defiant depiction, and though Massoud gives it a clear and bold embodiment, the role itself offers very little dimension. There is something peculiarly uninteresting about the role of Nora as written in the play. One does not really get a sense of why she has gone off nor a very good sense of what she has found. The various twists and turns of her account and her final decision to reject a couple of different kinds of offers from Torvald don’t make much sense. Laurie Metcalf realized the role of Nora in the production of this play on Broadway. She’s exactly the kind of actress, with hints of all sorts of things brewing under the hood, who might make a success of this rather starkly written role, and it’s no small wonder that she received acclaim for that production. Here it appears that director Les Waters is more inclined to deliver an account that explicitly avoids subtextual references or indications. This, I suspect, has not done so well by Mary Beth Fisher’s interpretation which would benefit from much more from that kind of internal steamy unsettledness that I expect gave Metcalf’s performance its umph. The result here is a strange lack of sympathy for Nora and her predicament. One feels more for Torvald and the family she left behind than for her embarkation on a new life for herself. One expects that’s not really the intent Ibsen might have envisioned for his emblazoned, though tragic, young heroine.